We are excited to introduce the brand new Nerf Rival Interactive Challenge to the greater Rockford area! When you rent this item you will recieve 10 Interactive Vests, 10 Rival Blasters and unlimited Nerf darts. The vests have an integrated HIT light target, on which you can shoot with a Nerf Rival Blaster and keeps track of team scores on a digital scoreboard. It is played with two teams of 5, Red Team vs Blue Team. Lots of different types of team games can be played with this system. 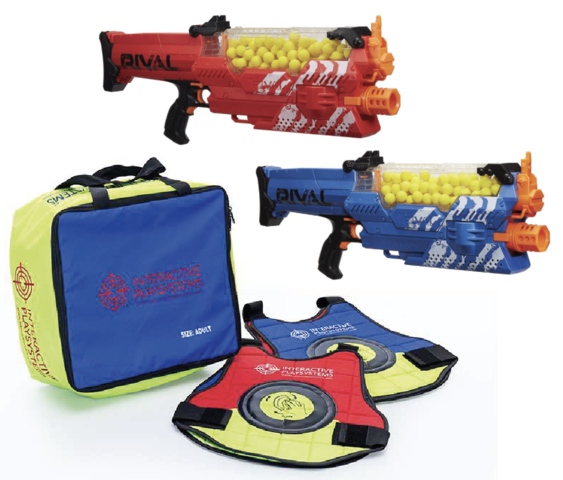 Nerf Rival Interactive Challenge is perfect in combination with our Blue Crush Rival arena, or our Supairball Bunkers, or combine both and create an Ultimate Nerf Blaster Zone Course! Next to children sizes the vests are also available in adult sizes.